Sean Dyche is waiting on news of Robbie Brady’s knee injury, but admits it looks a serious one. Brady was forced off midway through the first half after hurting his standing left leg in a challenge on Leicester centre back Harry Maguire. The Republic of Ireland winger was stretchered off, with his knee in a brace, and taken to hospital, and Dyche said: “We’re waiting on factual news, but it looks like it’s more serious that not serious to me, and we’ll have to wait and see. 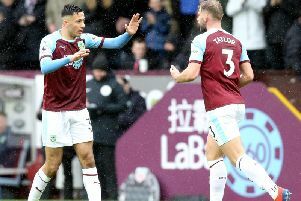 Brady had been excellent as Burnley bossed the first half, after falling behind to a sixth-minute Demarai Gray goal, which didn’t aid the Clarets’ cause, given his recent fine form: “I didn’t think it was the exact turning point, but it wasn’t helpful, he’s in really good form. Dyche felt his side deserved a result, particularly given their first half showing: “Overall I think we deserved something, I think it was tight, I thought we were very good first half - we carried on our very good form of late with some very good play, but effective play, that’s the key. “It was a really soft goal obviously, really poor, we got caught early, a bit flat footed, which is unlike us - we normally smell danger quicker. “I’m certainly not going to over-question the players, they’ve been fantastic defensively, and we defended resolutely through the rest of the first half, and played really well. “We dominated a lot of the first half. “Second half we expected a reaction. They often have one kicking into that end, so we warned the players about that. “But overall, I still think the performance probably warranted something. “The margins are tight, they had a chance to go 2-0, we had a chance one v one to go 1-1, and it can be like that. “But we expected what we got, a team that defend deep and try and counter, until the game opens up, and it becomes a bit of a basketball match. “Overall, it’s hard to doubt the players who’ve had their third game in a week and have been outstanding physically again, right at the end still trying to score, when Barnesy just misses it and we nearly get a sneaky own goal. It was Burnley’s third game in six days, which also included a trip to Bournemouth midweek, but Dyche accepted: “I don’t overthink all the travel and all that, the fixtures are what they are, we get a heads up at the start of the season, they do warn you! “But it still has to go into the planning, and I was really pleased with the staff’s planning, the lads were physically excellent, going through every minute of the game, giving everything.